For the first 6 ½ years of our marriage, my husband and I lived in Memphis. The majority of that time was spent in a modest, brick house built in the 1950’s on a sidewalk-lined street shaded by dozens of towering, deep-rooted trees. As is often the case in older neighborhoods, many of the homes were inhabited by elderly people—some couples but mostly widows. It was a quiet street nestled in the heart of such a busy city and we loved it. 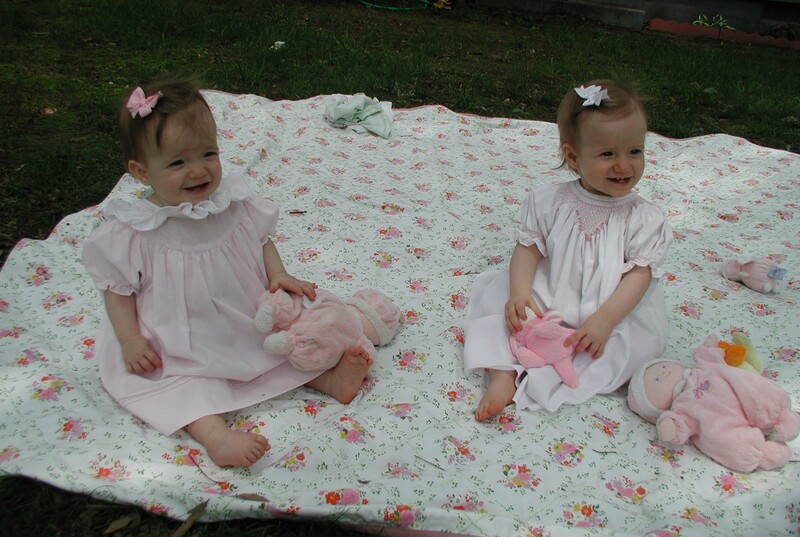 Beside the fact that our best friends lived across the street, the main reason I look back on that home so fondly is because it was the place we brought home our newborn twin daughters. Our girls lived there until the weekend they turned 2, when we moved to Murfreesboro. Next door to us lived an older woman named Golden Crenshaw. The first time we met, I was playing with my barely crawling babies on a blanket in the front yard. Ms. Golden walked over and invited us to her house to meet her housemate. I nervously entered with a baby in each arm, eyeing all of the breakable knickknacks in the warm living room which seemed to tremble in the presence of such small and possibly destructive children. Ms. Golden introduced me to her late husband’s aunt. She was a tiny, frail woman well into her 90’s and I was instructed to call her “Aunt” (I have no idea what her name actually was). The women asked me about the girls—their names and age. They asked me where I was from and what brought us to Memphis. Ms. Golden inquired about my name. “Abby? Is it short for Abigail?” she asked. “Well, we shall call you Abigail,” responded Ms. Golden. “Won’t we, Aunt?” She said a little louder. And that’s just what they did. In all the universe—other than the person who calls me back to see the doctor while I’m waiting in the waiting room, only Ms. Golden and Aunt called me Abigail. In spite of their precise attention to decorum, they exuded warmth and acceptance and a genuine interest in a fairly exhausted young mom. It’s like how some people can wear the color yellow while others just can’t. They could pull off the Formal Southern Thing without seeming stiff or snobbish. Ms. Golden did most of the talking with Aunt chiming in every once in a while to answer her niece-in-law’s question. Aunt would mostly stroke my daughter’s baby soft hair with her worn fingers and smile. They told me about Ms. Golden’s late husband and her daughters, one of which had also passed away. That first afternoon, they shared their stories and asked me mine. Over the next year or so before we moved away, we’d visit from time to time. They gave the girls matching dolls for Christmas which the girls would eventually take on many walks down those lovely, shaded sidewalks in their miniature pink doll strollers. I recently found one of those baby dolls, abandoned and unused lying face down in a dark corner of the play room closet. I picked it up and thought about that hot afternoon with Ms. Golden and Aunt. Then I thought about the other women who early in my marriage encouraged me and valued my thoughts: our church’s custodian who told me I was beautiful even though I was nearly 9 months pregnant with twins and ridiculously swollen. The scores of women who brought us meals after the girls were born. The doctor’s office receptionist who gave me diapers from her own baby’s diaper bag when I ran out during a long day of appointments for my 18-month old who had a broken arm. Women who were there for me just when I needed them and others who were there the rest of the time. Tugging at the tape ever so slowly and pulling back the wrapping paper, the present beneath gradually revealed itself. In a dark living room with only the aid of the soft glow of Christmas tree lights to illuminate my mischievous task, I spotted a length of hot pink nylon fabric with lime green plastic piping. It was a duffel bag, and it spoke to me of future slumber parties and sleep-overs and fun. But the joy I felt was tinged with feelings of guilt and remorse, because it wasn’t Christmas yet and I was sneaking a look at my present a few days early and without permission. I re-taped the package and slid it back under the tree. Though this was nearly forty Christmases ago, I still remember that feeling—the wicked thrill of doing something that was obviously wrong for which I might easily get caught, my only companion a miniature version of Baby Jesus in a Manger in ornament-form dangling on a tree branch just above my head. It’s a logical question: There’s the present. He wants the present. I bought him the present. So what’s the point of waiting? This is one of those universal human dilemmas with which we all must struggle—waiting. It’s why people say things like “Good things come to those who wait.” It’s an attempt to mollify that nagging frustration we feel as we are forced to wait for something. Our consolation that the prize had better be worth the delay. If you’re looking for an example of Championship Waiting, check out the Prophetess Anna in Luke 2. Scripture tells us that she had been a widow for most of her life and spent all of her days and nights at the Temple worshiping God and fasting and praying and waiting for the Promised Messiah. I can imagine her there, standing in the courtyard, perhaps busying herself with sweeping or tidying up. She notices a commotion. A young couple has brought in their baby to be circumcised and dedicated to God. Simeon, another Temple Frequenter, has spotted the family and snatched the baby in his arms, jubilantly. Simeon tells the mother that her son is the One he’s been waiting for. Anna hears bits of their conversation, words like salvation, lightand glory. Heart pounding and legs like jelly, she rushes over. Seeing Jesus for the first time, Anna doesn’t feel her 84 years as all of those sorrow-filled nights spent asking why she was alone melted away. She is joyful to be present for such an occasion—the arrival of her rescue. My experience with waiting has been up and down the spectrum, from Peaceful Patience to Raging Lunatic. I’ve felt it all. But, in the end, nothing beats the Big Reveal, when the time is just right to open up the gift you’ve been anxiously expecting for so long. It can come in many packages—big and small—like it did so many years ago in the form of a baby boy.